The poems read like a letter of love and truth, from a brooding man at sea, for those who are touched by literature. unal Narayan Uniyal is a sailor, a thinker and now a successful poet. 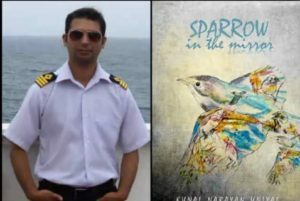 His first twelve years at sea became inspiration for his first book, “Kuch Khwaab Sagar Se”, which was written in Hindi and launched in 2014. Following the international success of his first collection, Uniyal is on his way to his latest title, Sparrow in the Mirror. The poet’s philosophy towards expression and the purpose of poetry guides his style. Believing that poetry is the shortest and the most effective medium to communicate the most complex web of emotions, the poet form is short and addresses a wide range of emotional, philosophical as well as realistic questions on a plethora of themes. The poet writes in an articulate and yet concise poetic form that holds the attention of the reader. Like his first publication, this collection deals with a wide range of ideas that cover all aspects of human life. Travelling through ideas of human failings and the act rising from the dust, between spirituality and worldly occupations, between notions of truths and un-truths, freedom, liberty and chains and overall settled in a feeling if overwhelming togetherness of humanity, this collection is a testament to a man who has spent ample time with nature in introspection, and with man, in camaraderie. As eloquent in English as his work is in Hindi, the writer shows a knack for the written word, quite wisely depicting how the world is composed of words and the only way one comes into it is through language. What stands out in this poets work the most is the relatability and accessibility of thought he brings into his poetry. Whether heavier ones about truth and spiritualism or ones about home and love, the poet speaks to the real experiences of his readers. While written in free form and reflective of a modesty, genuine and true to a rising generation of Indian writers, this book evokes feelings and ideas that are important for times such as ours. The book reads like a letter of love and truth, from a brooding man at sea, for those who are touched by literature. 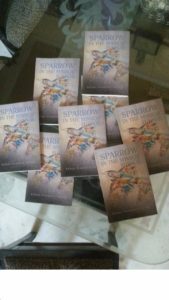 Sparrow in the Mirror (Collection of Poems); Author: Capt. Kunal Narayan Uniyal; Published by: Roman Books; Pages: 78; Price: Rs. 250/- in India and 8.5$ in abroad. Will India give Modi a second chance?